Much of modern dental care revolves around restoring irreversibly damaged and/or diseased oral structures, especially teeth. When one or more teeth are lost, your mouth's function can suffer significantly, as well as your general quality of life. Missing teeth make processing food and enunciating words more difficult, and the loss can have devastating, long-term effects on a patient's oral and overall health. As the only option that replaces lost teeth’s roots, dental implants are the only teeth replacement that can help stem the oral destruction that follows tooth loss. Below, we answer some of the most frequently-asked questions about the types of dental implants we offer in our Montgomery oral surgery office. Dental implants are crafted from biocompatible titanium, which allows the jawbone to fuse to the implant’s surface. The odd, and extremely beneficial, biological abilities of titanium were discovered accidentally by Swedish surgeon, Per-Ingvar Brånemark. In 1952, Brånemark conducted an experiment to study blood flow in vivo by inserting hollow titanium chambers into a rabbit’s femur. At the conclusion of the study, the titanium chambers could not be removed because they had bonded to the rabbit’s femur. Brånemark coined the term, “osseointegration,” to describe the phenomenon, and soon after, the first dental implant was successfully placed in the mouth of a volunteer. Today, biocompatible titanium and osseointegration remain the cornerstones of successful dental implant surgery. How Are Implants Different from Other Teeth Replacements? One of the most advantageous aspects of dental implants is that they don’t make modern dental prosthetics obsolete. On the contrary, they merely improve modern teeth replacements by providing a more stable foundation. Conventional dental prostheses, such as dental bridges and dentures, are typically anchored in place using dental adhesives or by bonding supportive dental crowns to the teeth adjacent to the gap. Dental implants, however, are surgically inserted into the jawbone, allowing the jawbone to grasp the implant securely by fusing to its surface. After the surgical site heals, usually in 4-6 months, the appropriate dental restoration will be attached to the dental implants, completing the final phase of dental implant placement. After experiencing tooth loss, a patient's jawbone will no longer receive proper stimulation and begin to atrophy, or shrink. Over time, this bone loss can become so significant that a patient will not qualify for traditional implants. Mini dental implants were developed as an effective restorative solution. Mini implants utilize smaller posts than traditional types, so they are are more appropriate for patients with limited jawbone density. We can review your candidacy for mini implants during a personal consultation. What Are Immediate-placement Dental Implants? In some cases, patients may qualify for immediate placement of dental implants (also called immediate loading). The dental crown, bridge, or denture is attached to the implants at the same time as implant placement, significantly reducing the total amount of treatment time. 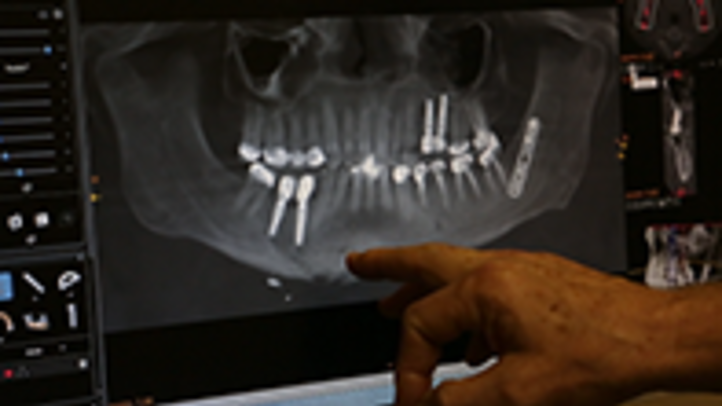 Though faster and more convenient, immediate implant loading has significant limitations. After a thorough and comprehensive examination, we can determine if you’re an ideal candidate for immediate loading, or proceed with traditional, two-phase dental implant placement. Patients who’ve lost one, several, or all of their teeth, but have retained an adequate amount of jawbone structure, are potential candidates for dental implants. Even if you already depend on a dental prosthetic, we can upgrade your replacement teeth with one or more dental implants for improved form and function. If your jawbone is too thin, low, or otherwise insufficient, we may recommend a prerequisite procedure, such as bone grafting, to improve your candidacy for traditional implants. To schedule a dental implant consultation, contact Oral and Maxillofacial Surgery today. Our implant dentistry practice has three office locations, and we proudly serve patients from Montgomery, Prattville, Troy, and the surrounding communities.